Covered call screeners, options scanners, risk graphs… traders are spoiled for choice these days when it comes to options analysis software, so we rolled up our sleeves to help you find the best software to meet your needs. You can stumble across some pretty good software from small companies but if you want cutting-edge tools featuring real-time data and an extensive functionality, the top options trading brokers are your best bet. We narrowed down a shortlist of leading brokers and platforms: thinkorswim, tastyworks, Ally Invest, and TD Ameritrade. No article on the best options trading software would be complete without thinkorswim ranked near the tippy top. Owned by TD Ameritrade, the thinkorswim platform is built by options traders for options traders. As any options trader who has been around the block knows, covered call writing requires selling options regularly. Even if you are selling calls for a living to earn passive income, it can still be tedious to pick options for every stock across a large portfolio. To help active traders get around this bump in the road, thinkorswim introduced its Strategy Roller, which automatically rolls forward covered call options on stocks you plan to hold for a long time. Experienced traders can place their portfolios on auto-pilot and let the thinkorswim Strategy Roller do the heavy lifting. thinkorswim features screeners galore. Whether you’re looking for a covered call screener or simply want to trade penny stocks to spice up your portfolio, thinkorswim scans will only be limited by your imagination. Among the many stock and options screeners, you may stumble upon the Sizzle Index. The Sizzle Index is designed to find stocks with unusually high volume and can be found in the Stock Hacker scanning tool. High volume stocks with big price swings often have associated options with high implied volatilities, which lend themselves to a wide range of options trading strategies. Experienced traders looking for an extra edge will be thrilled by thinkScript. thinkScript is an embedded programming language that gives traders more control over stock charts and studies. Although thinkorswim features over 300 chart studies, thinkScript software can be used to build custom technical indicators. Many of the same team members who built thinkorswim went on to build tastyworks software. And like thinkorswim options trading software, tastyworks is ground-breaking and world class. 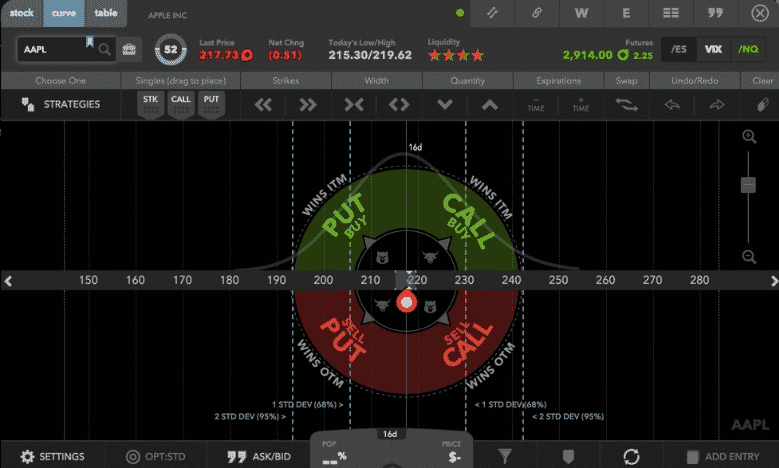 Beyond social trading features to help you see which trades other options traders are placing, tastyworks provides a “Curve” to help view trade profitability zones. Not sure whether an options strategy will be profitable when a share price moves? You won’t be left in any doubt how the terms in-the-money, out-of-the-money, and at-the-money affect options pricing and portfolio profitability. The investment minimum to get started at tastyworks is $0 and no commissions charges are applied to closing stock and options trades. If you’re not sure where to begin, you can also use the tastyworks Trade Journal to keep tabs on paper trades and listen to a daily live stream of interviews and commentary from top options traders. Make no mistake about it, tastyworks is a platform for active stock, options, and futures traders. If you’re looking for hands-off investment management, you’ll fare best at Betterment or another top robo-advisor. tastyworks is perhaps the best options trading platform for stock market beginners too. Hundreds of educational videos are available via the tastytrade YouTube channel to help new traders learn the differences between straddles vs strangles, covered call writing vs put selling, and collar trades vs married puts. Before Ally Invest snapped up TradeKing, it lacked the pizazz of tastyworks or thinkorswim when it came to options analysis software. Having integrated TradeKing into its suite of trading services, Ally Invest now ranks among the top tier of options trading platforms and software services. The Ally Invest options platform, formerly known as TradeKing, is an all-round offering that features low commissions, in-depth research, no investment minimums and top notch tools and calculators. Profit / Loss Graph A visual depiction of profit and loss zones to help traders analyze profit potential before placing real money. 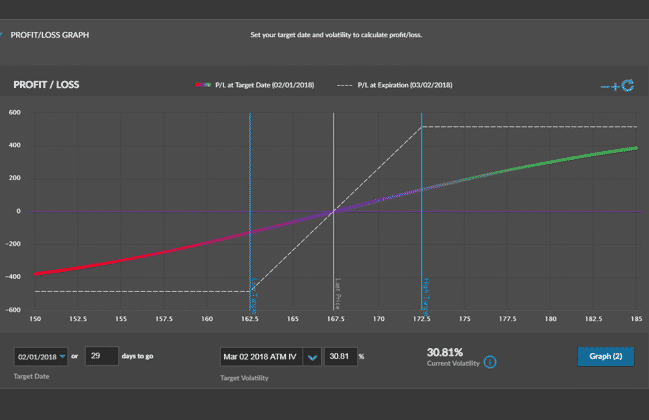 Probability Calculator A tool that incorporates implied volatility numbers to help gauge whether traders will hit their targets. Streaming Charts To analyze the underlying stocks upon which options will be traded, streaming charts featuring 90 chart studies and drawing tools can be tapped. Options Chains The options chains are easy-to-read and the overall platform highly intuitive, even to new traders. Research and Market Data Quotes, charts, dividends and more are featured in the Research and Market Data section. Watchlists Track portfolio holdings in custom-built watchlists. TD Ameritrade trademarked Fast Beta to help active traders analyze stocks that may be on the verge of breaking out of historical trends. 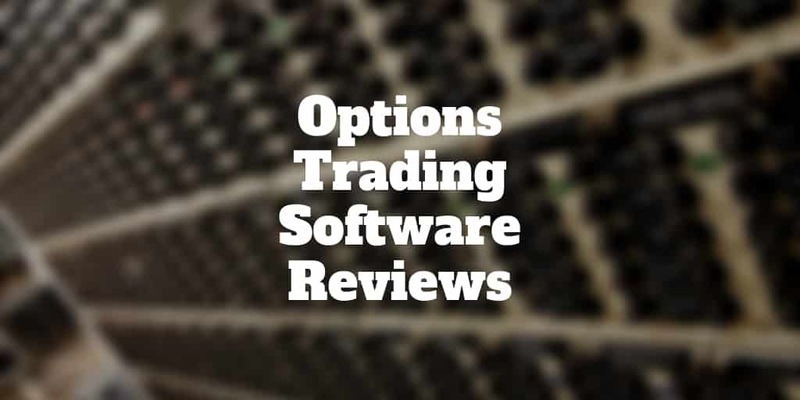 You might wonder why a screener that places higher emphasis on recent price data compared to older prices deserves to be featured in an options trading software reviews article? Savvy options traders know that volatility can be a boon for portfolio wealth by choosing the right options strategies. For example, options straddles and strangles purchased prior to large stock price moves can sometimes lead to big profits. If you’re on the hunt for the best options trading software, thinkorswim and tastyworks are our top picks. thinkorswim has the most complete offering with more tools, screeners, and chart studies than any other options trading platform. But tastyworks gives it a run for its money because it stands head and shoulders above its rivals by offering social trading, meaning traders can follow expert options traders. It’s hard to top tastyworks on price thanks to zero commissions costs on closing stock and options trades. Ally Invest is also five-star brokerage firms but doesn’t rank as well in our options trading software reviews. It is an excellent trading platform but lacks the bells and whistles that tastyworks and thinkorswim provide. Finally, TD Ameritrade is the brokerage firm that actually owns thinkorswim and has other trading platforms that cater to less sophisticated traders too. Technically, it owns the trademarks so we add it to our list but if you had to choose, thinkorswim is the place to go.